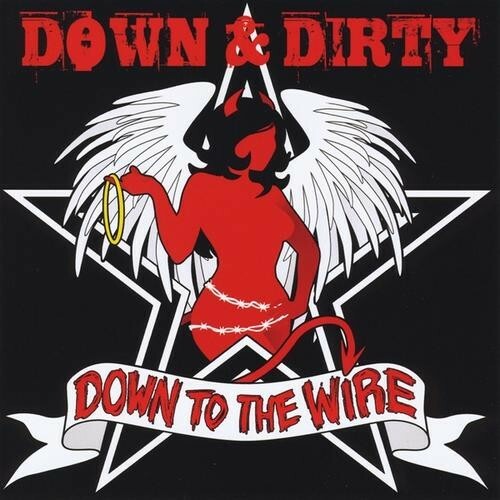 Flowing fresh and furious from the Windy City, Down & Dirty follow up their fun 2011 debut with another stroll through the glammy world of lipstick, leather and fluffy hair. With 'Down To The Wire', they don't try and reinvent anything, meaning from opener 'Alive Tonight" to closer 'Wicked Attitude' you get plenty of high energy rock and roll best played with a fag half hanging out of your mouth and a bare chest. The hair is wild, the sunglasses permanent and the music constantly entertains without making any of your hairs stand on end. Vocalist Stevie Ray Del Real may have a silly name but he has a decent set of pipes that suit the music, and the above average songs are helped by an above average production. There's some good, crunchy guitar riffs, and as a result the album gives the impression of a band that must give it serious welly onstage. Throw in a decent version of the Lieber/Stoller classic 'Trouble' and a sweet acoustic bonus track ('The Bottom Line') that has a great attitude to it and you have an album that should please plenty of Glam fans looking for a new buzz. 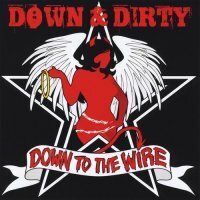 Sure, there's plenty of young, hungry glam bands out there, even in 2013, but on the strength of 'Down To the Wire' I have to say that Down & Dirty seem to have the stones to stand out amongst the herd.